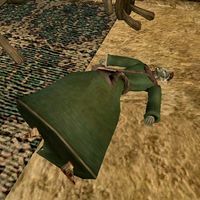 Nads Tharen is a dead Dunmer thief who can be found dead in his home at the south end of the St. Delyn canton in Vivec. The head of the Thieves Guild, Gentleman Jim Stacey, is concerned about Nads and would like you to check on him. Take the key from his corpse and bring it back to Jim. Nads's apartment can be easily accessed by using Almsivi Intervention, which takes you to Vivec Temple, and then crossing the bridge to St. Delyn. This page was last modified on 24 August 2018, at 20:44.